There's just time for a short post today. There is much I need to do today so my time on the computer is limited. But, I just had to share this pretty card I made for a new challenge I've found, Craft Hoarders Anonymous Challenge. As with many crafters, I do have a 'hoard' of supplies that I always think I'll use later. I think that's why I'm going to like this challenge, it let's me dig into the stash and finally use it! The pretty pink roses are what I've been keeping for that special project. To learn more about this new challenge blog, click on the link below. It's going to be such fun! Challenge #1: What's Your Style? Share a project that showcases your signature style. Dig into your hoard and pull out items that make you shout with crafty joy! Whip up something that has your creative name all over it. Do you, because no one is you-er than you! That's gorgeous!! definitely worthy of using the beautiful roses! Love it! This is one stunning creation! Those roses are awesome! Thanks for joining us in the Craft Hoarders Anonymous Challenge! Those roses are awesome!!! Thanks so much for sharing with us at Craft Hoarders! This is a beautiful card! 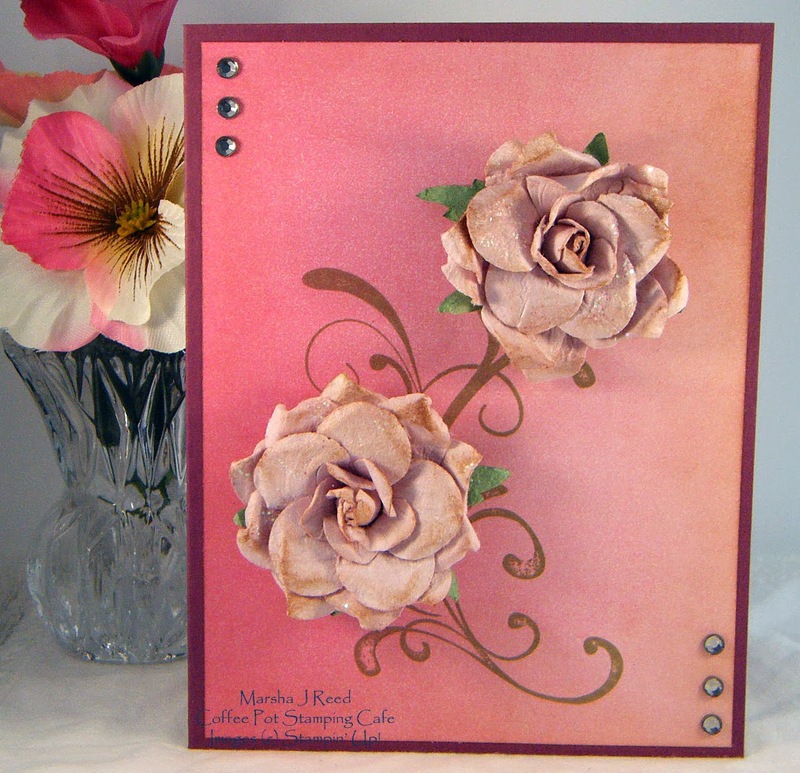 I love the soft background, the elegant stamping and those gorgeous roses! So glad you found the challenge! Thanks for playing along in the very first Craft Hoarders Anonymous challenge! I am so happy to see you dig into your hoard! I hope you play with us often! Thanks for joining us at Craft Hoarders Anonymous for our very first challenge! Simply beautiful! Those flowers are gorgeous and the way you've incorporated them into your card is masterful!! (I can see why you hoarded them so long, though!!) Now the question is. . .will you part with the card? :-) Thanks for sharing your style with us at Craft Hoarders Anonymous! Love your roses, beautiful.... thanks for stopping in to play with Craft Hoarders Anonymous!